We believe there are about 30 million Africans who can disrupt Africa. Our mission is to write their stories. African Innovation is at the core of the Disrupting Africa Encyclopedia. The Encyclopedia has one singular purpose - "To promote African Innovators and Entrepreneurs". We believe these exceptional individuals are the key to driving Africa's growth and ensuring we are ready for the next century. Our role is to continuously tell their stories, objectively. Through a combination of mathematics, anthropology and technology trends, we seek to find innovators and entrepreneurs bold enough to shift the dial on the African narrative. The task at hand is huge and will require every passionate African to help in identifying the 30 million inspirational Africans. Read about some of our all-time favourite innovators below. 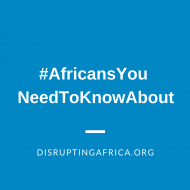 The spirit of the Disrupting Africa Encyclopedia is embodied in the #AfricansYouNeedToKnowAbout social media campaign. The campaign first started in 2016 in print form with the release of the book "Disrupting Africa: The Rise and Rise of African Innovation" and then morphed into an online engagement to ensure an up-to-date resource is kept on African innovation. Our goal is to ensure we identify all inspirational African Innovators, both on the continent and diaspora, and accurately document their stories. This page was last edited on 15 April 2019, at 08:56.